So today I was short on time, so all I did were my dailies and (spoiler alert) I didn’t open anything. BUT, I still have the floor, so I wanted to respond to some pretty good points from Reddit and the comments. These aren’t exact quotes, more like paraphrases. Why draft? After all, a new player won’t be able to be as successful as you in draft so they will take longer to build up their collection anyway. That is true. I have lost 2 games in my past three drafts, which is an 83% win rate (albeit from a very small sample size). I would expect the average new player to have a much lower win rate – probably around 40% or less. 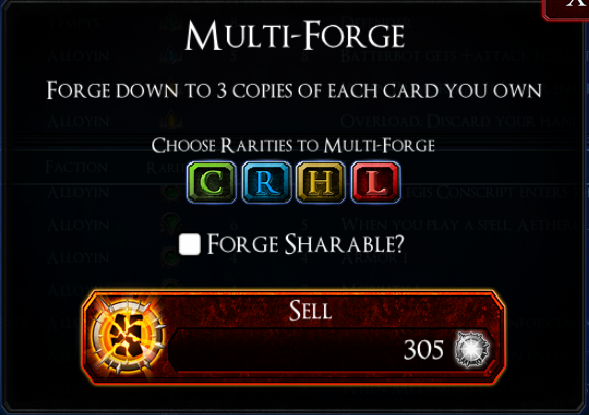 Solforge is a difficult game, and win rate starts off really low as a new player learns the mechanics of the game and which cards are not worth playing, then climbs as they learn these things. 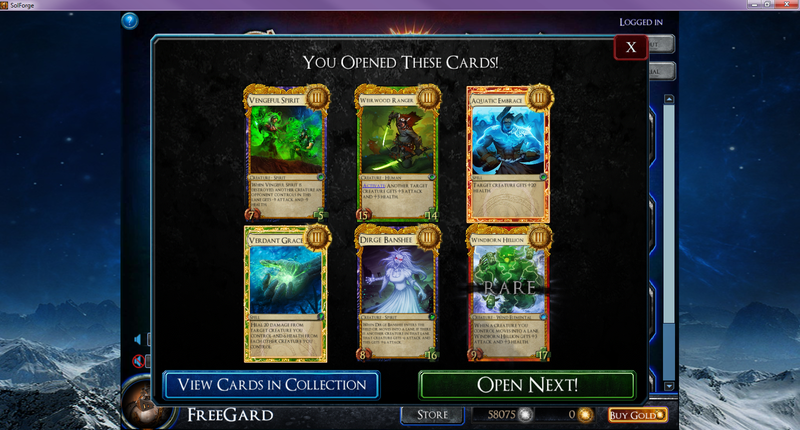 So, yes, I am getting more cards than the average new player just because I will win more. However, it’s not significantly more. Let’s look. I’ve explained before that I’m not playing in Expert drafts, since they rely heavily on win rate in order to build your collection. This is because the expert drafts themselves do not give you cards; the only cards you keep are what you win from your prize pack. That means winning is everything in these drafts. I could play in quite a few of these before I lost enough to no longer play in one, but I wouldn’t imagine an average new player would do the same. Therefore I’m only playing in the casual Drafts. 0-4 (0% win rate) gives three booster packs, plus whatever you drafted in the draft itself. This is huge for building a collection, since the actual draft is giving you thirty cards – that’s five packs worth of cards for 3 event tickets. 1-3, 2-2, and 3-1 all give pretty similar prizes. 1-3 gives you a booster (6 cards, 1 rare), 2-2 gives a Bronze pack (6 cards, 2 rares), and 3-1 gives a Silver pack (6 cards, 1 heroic, 2 rares). In terms of building collection, you don’t get very many cards despite your record, and honestly the different between a Booster pack and a Bronze pack is slight. Silver is better, because it guarantees a Heroic, but it’s not significant amount of collection building vs win rate. 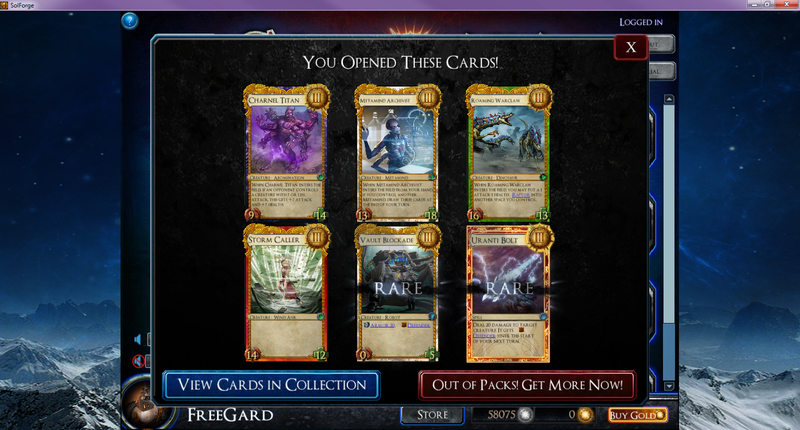 4-0 gives a Gold pack, which is 2 heroics, 2 rares. That’s pretty good for collection building since it gives quite a few heroics, but honestly the 8 cards (+2 from any of the previous packs) is a little more influential, since it gives you more chances at rares. So, I guess this is pretty long-winded. But tl;dr why do I draft? is because drafting is a good source of cards that does not take win rate into account. New players want to play the game, but don’t have cards, and are also bad at the game. Draft gives them an avenue to improve with a competitive environment, but still very low risk (since 4-0ing a casual draft still not let you draft again), and gives nine packs worth of cards even if you 0-4. Plus, it also lets me make draft videos, which is fun and educational! Weekend Warrior is an exceptional way to gain cards, especially provided your win rate is high enough. Why not just save up tickets for it? So a 50% win rate guarantees you half of your entry, plus a Heroic. 3-1 is two heroics and you get to play in another tournament. And, unlike Expert Drafts, they are super cheap to enter. It’s a very good, high value system. The reason I don’t save up for Weekend Warriors is mainly because I think drafting is pretty big for collection building. Yes, Weekend Warrior is the tournament with the absolute best value hands-down… but it’s a slow method of building a collection, since it’s only 1 prize pack at a time. I wish the calendar on solforgegame.com was kept more up to date so I could see what the weekend warrior tournament is in advance so I could save up for it. However, it’s not. What I may end up doing is limiting myself to 1 draft a week, leaving me with 4 Event Tickets for the other 4 days. That’s enough to enter in 2 Weekend Warrior events, plus however many more I can enter based on performance. That way I can still draft, and also play in WW tourneys. That actually sounds like a good plan, I will try to implement this one next week. The tournaments on solforgeladder.com that are pretty F2P-friendly (sealed, draft, Unheroic) are free to enter, and give a random participant 1300 gold ($5)! There is no reason why you shouldn’t be playing in these. Again, I agree! The tournaments on solforgeladder can be very fun, as it is great interacting with the community, and the cost of needing to craft the commons/rares that I don’t already have that I would need to play Sealed is pretty minimal. Unheroic is also pretty cheap!